I remember a discussion at the SNDO (School for New Dance Development) in the early ‘90s about the radical potential of dance. Among the many possible forms this might manifest, the one that seemed clearest to me, more so than witnessing dancing happening in other bodies, was in experiencing the act of dancing itself. I guess this is why teaching became so important to me. Some years later, I conceived of presenting a workshop series called BodySchool. 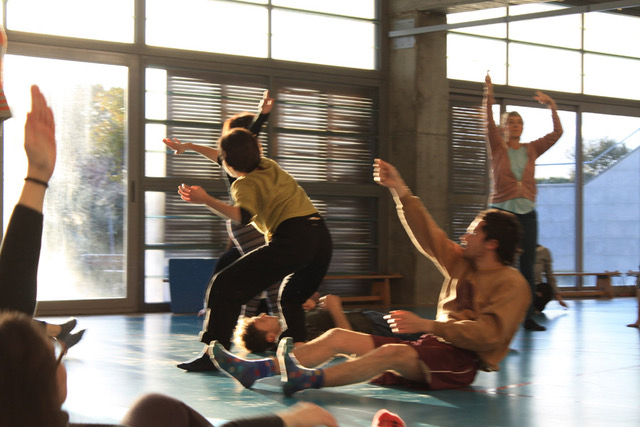 The idea was to teach exactly the same somatics and contemporary dance practices that I would teach in contemporary dance education, but reframed to be accessible to anyone, and directed towards moving through everyday life situations. What I wrote then and still believe to be true is this: “When we are born into this world we first encounter it physically and perceptually. The way we learn to orient to and move through the world sets the ground for all the other skills that we learn in life.” Following from this, improving how we move through and perceive our environment has the potential to improve all that we do. My formulation owes a lot to Moshe Feldenkrais who proposed that, if we consider a human being as a functional system, then improving the level at which any one functional component of that system performs will necessarily raise the performance of the whole system. Feldenkrais divided the functional components of human being into acting (moving), sensing (perceiving), feeling (emoting) and thinking (cognition). It doesn’t matter with Feldenkrais’ categorisation or not, since the general principal remains the same. In the summer of 2010, I met Auxiliadora Gálvez Pérez (Auxi for short) in a workshop I taught at Impulstanz in Vienna. She was developing a PhD proposal on how dance practices could contribute to the development of architectural processes. We corresponded from time to time over the next eight years, exchanging references and wondering about possibilities to collaborate. 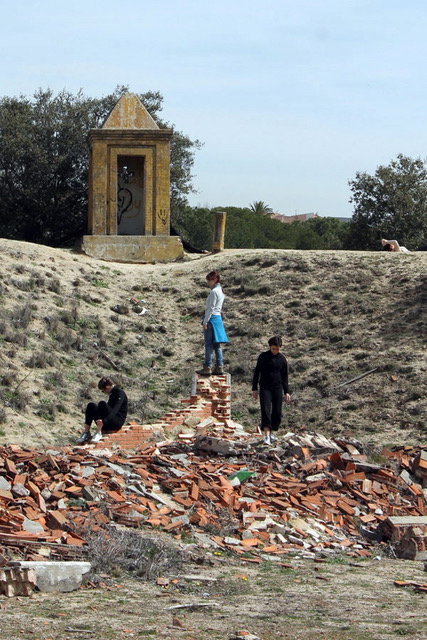 During this time she completed her PhD, became a professor in the school of architecture at CEU San Pablo University in Madrid and much else besides. She also began training as a Feldenkrais practitioner and is about to qualify. She presents her work under title Platform for the Application of Somatics for Architecture and Landscape (Plataforma de Somática aplicada a la Arquitectura y el Paisaje) where she gathers her research, work in the field and pedagogical practices. Anecdotally, I have heard mechanics and engineers talk of developing a “feel” for solving problems: a car mechanic who just by listening to an engine knew where to look for the problem; or a sound engineer who could estimate with great accuracy (when measured quantitively) the amount and placement of baffling needed to dampen problematic sound refections. But what of the developing a “feel” for the structure and dynamics of one’s own body moving in relation to the environment? 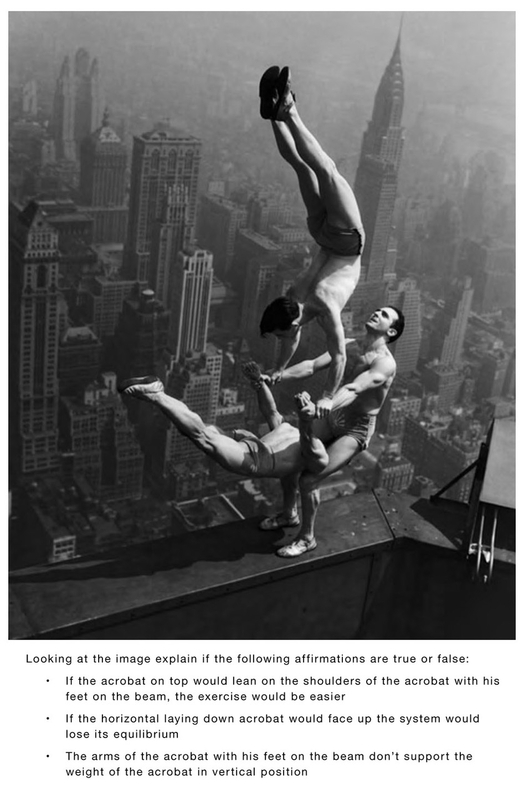 Could architecture students who studied somatics develop more of a “feel” for solving problems in the realm of structural engineering thank those who didn’t? 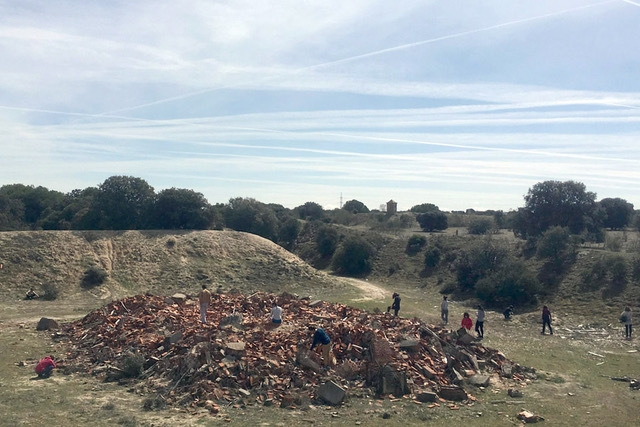 In the academic year 2016-17, Auxi trialed a one-year extra-curricular programme entitled the Laboratory of Somatics Applied to Architecture and Landscape. The aim of the programme was to construct a somatic programme aimed at enhancing “spatial thinking” and “structural thinking” among her architecture students. In order to secure funding support, she set about devising test regimes to measure the effects of the programme. What was most striking to me was the way the “structural thinking” test was undertaken since it tested for the kind of systemic learning that was the premise of the BodySchool workshops. Students were presented with a series of visual representations of structural engineering problems accompanied by statements which they needed to judge as true or false (see the example below). At the end of the year, undertaking the somatic education raised the students scores by 11% from 63% to 74% compared to architectural students who didn’t undertake the programme of somatic training. You can see the report of the first year including the complete structural thinking test here. Before going further, I have to confess that, despite being known as a somatically-oriented dance teacher, I find the way that somatics is commonly conceived of and often spoken about as hugely problematic, in particular how it tends to place us inside our own somatic bubbles. This is a larger topic that I have been busy with for the last decade and more, and inspires my latest thinking and practices. It’s easiest to explain through my own personal history. I’ve written elsewhere of my own childhood movement problems and how my study of dance and somatics helped me to grow towards healthier movement patterns. When I look back over nearly 30 years working in these fields, I feel that around 15 years ago I underwent a paradigm shift in how I worked with the so-called mind-body relationship. It’s a long complex story that I attempt to tell here very simply. I’ve always been concerned with my alignment and working with somatic methods – in particular the Feldenkrais Method and Body Mind Centering – gave me tools to work with it. This first period I could broadly characterise as micromanaging my alignment. My attention was largely with what was happening inside my skin. I noticed a connection between the experience of my physicality, how this affected my mood, and the affect that this had on how I moved through the world and on my interactions with others. But broadly speaking I was attending to what was happening inside my own skin. Encountering the work of Hubert Godard, via Caryn McHose who I’ve studied with since 2003, brought me into a new paradigm of seeking alignment, not by micromanaging inside the bubble of my own skin, or even my own kinesphere, but simply through orientating to the environment; letting the movement of my attention and sense of direction reaching out into space organise me. I find it a subtle but profound shift. Retrospectively I understood that many of my dance teacher’s had been suggesting the same – Steve Paxton and David Zambrano to name but two – but though Godard’s work via Caryn I also acquired a conceptual framework to understand and speak of it better. There’s much more to it, but that’s it in a nutshell. This had a lot to do with being metaphorically stuck down my own particular rabbit hole. And many somatic practitioners include outward directed attention and relating to the environment in their practices. But I notice that in situations marked out as somatic, in both teaching and studying it, there’s a strong tendency for people to gravitate towards internally directed attention and also, though this is another story, towards slow movements. Having woken up to the importance of space, in the last five years, though a combination of research by reading, personal experience and researching and developing my own movement and perceptual practices, I have come to the conclusion the problem with somatics is that it rests upon a spatial metaphor of the mind-body relationship that is implicit in Western culture. I think that it is this spatial metaphor, invoked in the definition of somatics as “the body as perceived from within by first-person perception” by Thomas Hanna in 1977, that has increasingly come to reinforce the kind of hyper-individualism of our age. It tends to disconnect us from each other and our environment by locating what we each experience as “me” within of the envelope of our skin inside the bubble of our kinespheres. And it can serve to disguise the structural societal conditions that create the conditions for many types of discomfort we might feel in ourselves, with the result that if I feel uneasiness, discomfort or pain then there is something wrong with me. Consequently, if only I get enough _______ (fill in the blank space: psychotherapy, Feldenkrais classes, Yoga, etc) then I will be fine and life will be good. The spatial metaphor of the mind-body relationship could be said to arise from a Newtonian worldview. But how could one re-imagine this relationship in a way that is more congruous with the counterintuitive worlds described by general relativity and quantum mechanics? In short, in the spirit of Deborah Hay, I’ve been engaged in researching through my practice the question, “what if it’s not the mind that lives in the body but the body that lives in the mind?” What happens if we identify ourselves not with our material bodies but with rather with the process of unfolding fields of consciousness whose medium is the space both inside and beyond our material bodies? What if our mind-fields interweave, affect, and are affected by, not only each other but with the entirety of the non-human universe? What if interconnectedness and embeddedness is fundamental to our being? These are the questions that I explore in my workshop Extended Mind Practices. 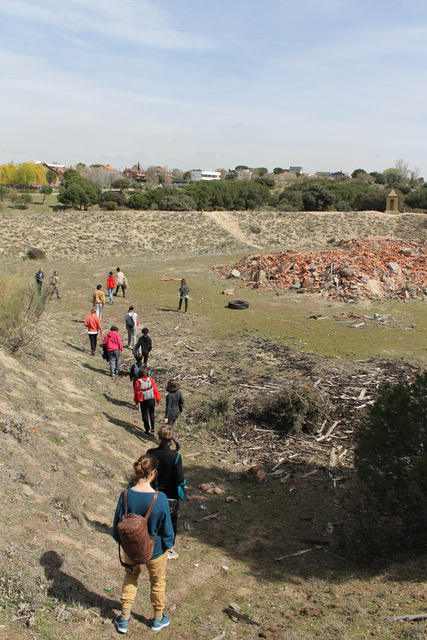 In March 2018 while visiting Spain, I was able to make a contribution to the second year of the LSAAP programme. The course is structured so that each week there is a studio-based class and the next day a class that happens on-site somewhere. I was invited to teach one of these two-class modules. Auxi was generous enough to suggest that I do whatever I thought might fit best in the context of the whole programme. She was also aware of my current research interests into extended mind practices and was excited how that might be applicable in the field of architecture in general and by her students in particular. But what to do in just a few hours as a brief introduction. There was already a lot of Feldenkrais and experiential anatomy featuring in the LSAAP programme, so I chose to offer a couple of key exercises that encompass some principles that have become increasingly important to me. And, given the time constraints, I chose to experience over explanation/theory. Space is obviously a common concern between the world of dance/somatics and architecture. From what wrote above about somatics, then I regard space as the medium through which we connect with ourselves, each other and the world. I’ve developed a whole repertoire of exercises and practices that offer the possibility to explore this alternative relationship of mind-body in Extended Mind Practices – but given a single studio-based class, I chose to present what I call the “The Spider Person Class”. To me it encompasses so many essential principles of movement that I joking refer to it as “everything there is to know about movement in one-hour”. I like it because it offers the possibility to work with a wide range of movement dynamics, from lying still to falling down and back up again; I’ve done it with all ages, from teenagers to pensioners; for most people it changes their experience of their environment in a subtle but clearly perceptible way; it brings most people into a way of moving that seems easy and, coincidentally, to be recognisable as dancing. The class begins in standing, noticing among other things how far away the ground appears to be, reaching down to touch it and seeing what that journey feels like. It then unfolds first through an guided sensory tour of the sensing skin, the vital fluid mass of the tissues, and the structure of the skeleton, which for years I’ve referred to as the architecture of the bones. Then a developmental sequence that mirrors how we learned to push into the support of the earth and reach out into the world around us with our attention through space in order to come to sit, stand up and walk. Towards the end of the class, I give the image of spider person to help this process: first we point to what we want to reach towards, imagining a spider’s thread shooting out to fix on something, then reeling in the thread to pull ourselves up towards where we are reaching. And on the way back down to the floor, using the feeling of holding onto the thread to help lower ourselves back down to the ground. The image of spider person is simply a trick to bring people’s attention out into space and organise it directionally. We experience how moving in relation to our environment is a very different sensation – often it feels lighter, less effortful and more graceful – then when we are thinking of reorganising our material bodies through a series of shapes. We end in standing and the aha moment for many comes when I ask them to look down at and then touch the floor; as if by magic for many it seems like the floor has become closer, that the journey down to touch the floor has got shorter. The relationship to the environment, the feeling we have for being in the world has changed in a subtle yet obvious way. For me, the Spider-person class is a great physical practice to bring people’s attention out into space and offers an experience of moving with and being situated in the environment. In this case, it didn’t matter that I had no time to explain how this could open the way to re-experiencing the mind-body relationship. The effects were clear for most – that the boundary of what is me and not me became more blurred and less identified with the skin; the experience of moving with space is very different from moving in space – and this was the experience that I wanted to offer. Another time I could go further since I am interested in how such experiences might offer alternative viewpoints from which to meet some of the challenges of the times in which we live. Years ago I studied for a couple of years with Bill Palmer, a wonderful teacher based in the UK who synthesises Traditional Chinese Medicine, developmental movement and gestalt theory into something he calls movement shiatsu. During this time I learned a process from which he called the The Energetics Of The Gestalt Cycle. I simplified it and adapted it for dancers, calling it Tracking Our Interest. The process goes like this. We close our eyes and rest in stillness – lying, sitting, standing or in any position will do. When we feel our interest in resting diminish, or something in the surrounding environment calling our attention, we open our eyes and, if necessary, sense around (looking, hearing, smelling) until something catches our attention. Then we begin to move through space towards that thing – now the interest is in the act of travelling towards something. When we arrive at whatever we we moving towards, we shift into relating to it – looking, touching, smelling, playing with it. As soon as we sense our interest diminishing then we close our eyes and return once more into rest, completing the cycle. Then we repeat the process. again and again. To begin, I artificially lead the group through this cyclical process so that they can recognise and learn the form – how one stage leads to another. I talk through how the interest shift while taking around 5mins to complete each cycle. The next stage is to let the students circulate through the process at their own pace. The cycles take much longerThe final stage was to let go of the form but continue to track how our interest changes. It’s interesting to watch how people gravitate to the part of the cycle that their system is calling for: some in deep rest; some choosing long journeys; and some engaged in relating to something for an extended period of time. I like it because it is a physical practice in which the task is to track and follow our interest as it grows and diminishes; in doing so we get a chance to identify what being interested feels like as a physical sensation. For me it’s one way to address the question, what am I truly interested in? or alternatively, where is my attention? One possible practical application of this approach is in the initial site visit, where an architect(s) encounter a site they will plan for for the first time. Traditionally they will photograph and measure in order to map the site. But what of other ways to gather information and map besides the visual and the quantifiable? In September 2018, I will again visit Madrid and this time, as well as presenting as part of the LSAAP, I will work with the fourth students on the architectural degree programme. 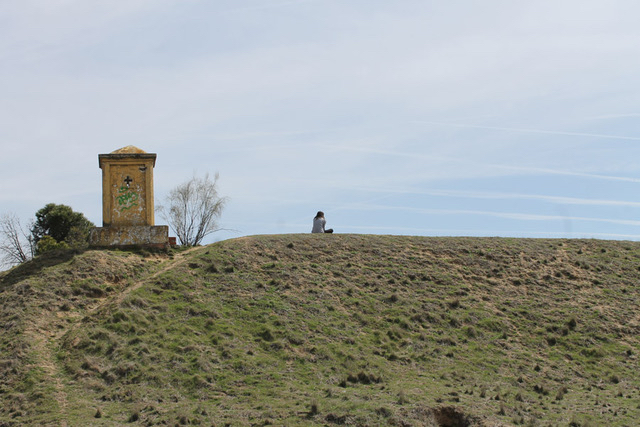 They will just have begun a project to plan for a residential development for a Third Landscape site – abandoned urban spaces which while neglected are nonetheless precious in hosting biodiversity – that takes into account the politics of inclusion and an ecological approach to building in a city. The idea is to talk with the students to get an idea of what approaches they are developing in their projects, in the light of this to offer a movement/somatic class to support and inspire them, to facilitate a visit to the site, and then to discuss with the students how their ideas have moved on as a result, offering feedback and suggestions where possible. 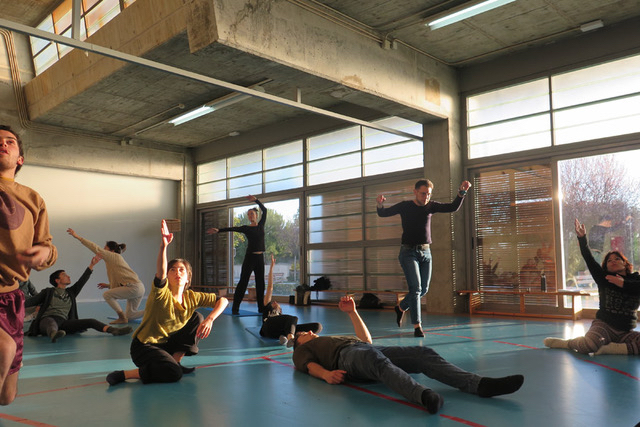 Through my discussions with Auxi and others working in the field of architecture I am discovering that dance and somatics has much to offer both in the education and ongoing training of architects, and in actual architectural processes. I discovered that as in dance, so in architecture, some of the radical ideas that were developed the late ’60s and early ‘70s continue to have influence and inspire younger generations; that their time has come in terms of wider acceptance. Lawrence Halprin, husband and collaborator of Anna Halprin, created public space works that he conceived of as architectural scores that invited the participation of the people who moved through them. And with Anna worked on a creative process called the “RSVP Cycles” to stimulate participatory planning. In Juhani Pallasmaa’s influential book The Eyes of the Skin – Architecture and the Senses (1996) he made a powerful argument that buildings should not just be designed according to how they look (ocularcentricity) but how they feel. I discovered the work of Philippe Rahm who is known for extending the field of architecture to encompass atmospheres – his designs for the meteorology of a building. In one pyramidal design for a house the bathroom is on the top floor since it is the warmest and the dampest, the kitchen below, below that the living spaces, and on the ground floor are the bedrooms where it is coldest and driest. The low energy input design allows for optimum distribution of heat and humidity. I dream about atmosphere in a different way, to take into consideration affect as product of overlapping fields of mind. How might approaches to architecture be altered by this understanding? How could it influence how we experience and inhabit existing sites? How could playing with a new metaphorical relationship between mind and body result in new skillsets to be deployed in the design and realisation of structures for the future. In architecture as in dance I find space to dream and create. I am certified to teach the Feldenkrais Method®, the Body And Earth work developed by Andrea Olsen and Caryn McHose, and have an MA in Dance Pedagogy from TEAK. I studied for two years at SNDO Amsterdam and have made extensive studies of Authentic Movement, Movement Shiatsu, Ideokinesis, Body Mind Centering and experiential anatomy. I specialise in teaching the application of somatic approaches to contemporary dance practices. 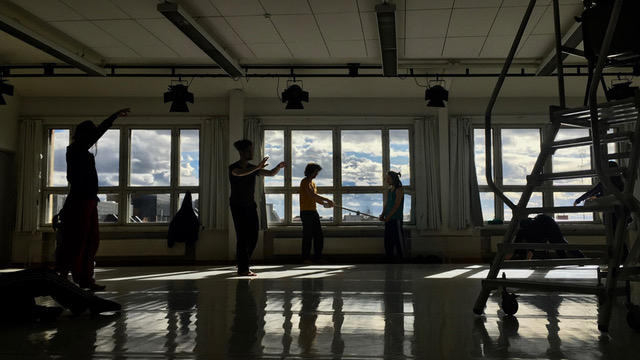 I currently teach in the Dance and Choreography at The Danish National School of Performing Arts. I teach at contemporary dance centres (eg. TanzFabrik (DE), TanzQuartierWien (AT), K3 (DE), Danshallerne (DK)) and festivals (eg. ImpulsTanz(AT), TanzWerkstatt Europa (DE), Bolzano Danza (IT)) in Europe and beyond.